Greetings again from the darkness. Hollywood is a true believer in the theory that imitation is the greatest form of flattery. The constant attempts to capture the same lightning bolt in the same bottle would be kind of funny, if not so frustrating for us movie-goers. Liam Neeson’s surprise hit with 2008’s Taken spawned not just a sequel, but now two movies from director Jaume Collet-Serra – this one and the disappointing Unknown. Oh well, it’s easy money for Neeson and it’s not the worst early year release. It’s been 20 years since Liam Neeson’s Oscar nominated performance in Schindler’s List. Rather than a great actor, he might best be described as a familiar screen presence … a guy we can somehow relate to most of the time. Well, at least until he unleashes his particular set of skills … this time in an airplane lavatory! The set up for this thriller is quite promising. 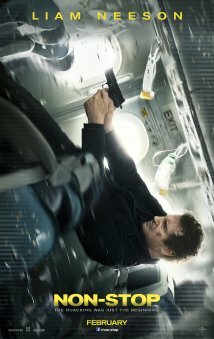 Neeson plays an alcoholic US Air Marshal looking and sounding quite beaten down by life in the first few minutes. Once on his flight, he receives a text informing him that someone onboard will be killed every 20 minutes until $150 million is transferred into an account. It’s a combination hijacking, extortion, whodunnit murder mystery and blackmail story. Unfortunately the three first time screenwriters (one of whom “wrote” for the WWE) botch every possible twist and turn. With a plane full of suspects, we play right along with Neeson as he begins the process to narrow down. We’ve enjoyed the claustrophobic approach to movie thrillers before in such movies as Flight, Air Force One, Flightplan and even Phone Booth. For whatever reason, this plane never feels cramped and the tight spaces only come into play with the aforementioned lavatory fight scene, and even that seems like the most spacious airplane restroom in the history of aviation. Even the multiple drop-dead deadlines aren’t really played for full effect, and the decent supporting cast isn’t given much to do, save for looking suspiciously at Neeson. Julianne Moore co-stars, but mostly her role consists of disbelieving stares and a tilt of the head. Corey Stoll (“House of Cards”) gets a few juicy scenes, as does the always interesting Scoot McNairy. Unfortunately, Oscar nominee Lupita Nyong’o, Shea Whigham, Michelle Dockery (“Downton Abbey”), and Nate Parker have little to do, and the absolute wasting of Anson Mount is a crime. If you are skittish about flying, there is no reason to see this one, though the convoluted motive and lackluster reveal might help you forget the story takes place on an international flight. The one thing we do learn is that Liam Neeson can take a fire extinguisher to the head and bounce right back up without a mark. Let’s add that to his particular set of skills, while we less-than-anxiously await yet another collaboration between Neeson and this director coming in 2015. SEE THIS MOVIE IF: you have the late winter cabin fever blues and are in desperate need of a movie to get the blood pumping. SKIP THIS MOVIE IF: you are hoping to get a jump on next year’s Oscar season. Greetings again from the darkness. Should this be labeled a historical drama? Is it one man’s extraordinary tale of strength and survival? Does this fall into the “art film” category that so divides the movie-going public? The answer to all is YES, and I would add that it’s a masterfully crafted film with exquisite story telling, stunning photography and top notch acting throughout. The movie is based on the real life and writings of Solomon Northrup, a free man who was kidnapped and sold into slavery from 1841-53. Northrup’s story provides us a look inside the despicable institution of slavery. Needless to say, it’s a painful and sad process made even more emotional by the work of director Steve McQueen (Hunger, Shame). McQueen takes a very direct approach. Not much is left to the imagination. Torture, abuse, cruelty and misery take up the full screen. The only subtlety comes from the terrific work of Chiwetel Ejiofor as Northrup. His facial expressions and eyes are more powerful and telling than any lines of dialogue could be. 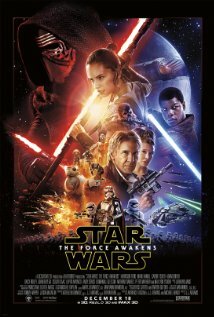 You will not find many details from the movie here. This is one to experience for yourself. It lacks the typical Hollywood agenda when it comes to American history. Instead this era is presented through the eyes of a single wronged man and his quest to return to his wife and kids, no matter the inhumane obstacles. We see Paul Giamatti as an emotionless, all-business slave trader. Benedict Cumberbatch is a plantation owner who has a heart, but lacks business savvy. And finally we enter the world of cotton farmer Michael Fassbender, who twists Bible scripture into threats directed at the slaves – his “property”. 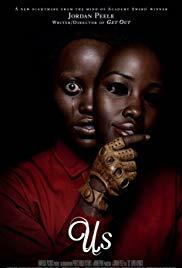 Fassbender dives deep into evil to find his character, and along with Ejiofor, Sarah Paulsen (who plays Fassbender’s icy wife), and Lupita Nyong’o (who plays slave Patsey, the center of the two most incredible scenes in the film), provide more Oscar worthy performances than any one movie can expect. You will also note Quvenzhane Wallis (as Northrup’s daughter) and Dwight Henry (as a slave) in their first appearances since Beasts of the Southern Wild. Other strong support comes from Scoot McNairy, Taran Killam (SNL), Michael K Williams, Alfre Woodward, a nasty Paul Dano, Garret Dillahunt and Adepero Oduye. Steven Spielberg gave us a taste of the holocaust with Schindler’s List, but not since the TV mini-series “Roots” has any project come so close to examining the realities of slavery. Northrup’s story seems to be from a different universe than the charming slaves of Gone with the Wind. I would argue that what makes this watchable (though very difficult) is the focus on Northrup’s story. While tragic, his ending actually deflects from the ongoing plight of those not so fortunate. It’s a story of a man who states he doesn’t wish to merely survive, he wants to live a life worth living. McQueen’s direction will certainly be front and center come awards season, as will many of the actors, John Ridley (the screenwriter), Sean Bobbitt (cinematographer) and Hans Zimmer (score). The only question is whether the subject matter is too tough for Oscar voters, who traditionally lean towards projects a bit more mainstream. SEE THIS MOVIE IF: you want to see filmmaking and story-telling at the highest level and based on the true path of one man during one of America’s most despicable periods. 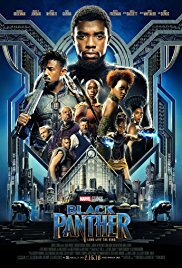 SKIP THIS MOVIE IF: slavery, complete with explicit scenes of turture and cruelty, is something you would rather read about than see depicted onscreen.